Following the last crisis important governance steps have been taken to bolster the resilience of the European Economic and Monetary Union (EMU). The changes include putting in motion a banking union, establishing the European Stability Mechanism (ESM), and strengthening the surveillance framework. However, there is broad acceptance that current set up remains prone to shocks that could shake its functioning and even imperil its integrity. Further progress is therefore needed for a stable EMU (e.g. Benassy Quéré et al. 2018). In general the remaining 'problem' can be described as a lack of adjustment channels to large shocks, given the incomplete nature of the financial union and the absence of common fiscal instruments. Key ingredients to overcome these gaps are the completion of banking union and capital markets union (CMU) as well as the introduction of a stabilisation function. And, as argued in this column, a financial union is not a substitute to a stabilisation function – they are in fact complementary. However, while the achievement of a full financial union is relatively consensual in principle, the value added of a central fiscal capacity is sometimes put in doubt (Heijdra et al. 2018, Feld 2018). Critics of the fiscal capacity make several points. They claim that: i) sizeable asymmetric shocks are infrequent; ii) private risk-sharing mechanisms, including as enhanced by the completion of banking union and CMU, could suffice to provide considerable shock absorption; iii) fiscal stabilisation can in any event rely on national budget stabilisers, provided that Member States properly adhere to fiscal rules of the Stability and Growth Pact (SGP). Finally, critics claim that any common fiscal tool could only be an incentive to moral hazard and a door for non-legitimised permanent transfers. They conclude that the risks of a fiscal capacity outweigh its advantages. We beg to disagree with this analysis. So too do the international organisations, which strongly favour the introduction of a fiscal capacity (e.g. Lagarde 2018, Draghi 2018, OECD 2018). Q1: Is there evidence of large cyclical fluctuations in EMU, including country-specific components? Q2: Does private risk sharing via the completion of banking union and CMU eliminate the case for a central fiscal capacity? Q3: Do national automatic stabilisers within the SGP suffice to smooth the remaining shocks? Q4: Does a central fiscal capacity necessarily entail moral hazard and permanent transfers? We finally recall, in conclusion, how together with other contributions, the Commission has proposed to move forward by tabling a balanced proposal. Business cycle fluctuations have remained sizeable since the inception of the euro. Interestingly, simple decompositions of the cycle suggest that output fluctuations comprise both a common component and country-specific developments, with the two weighing about similar proportions. The average standard deviation of output gaps is about 3% of GDP (Figure 1), implying that output gaps bigger than that are not infrequent. Moreover, when measured relative to the average of the zone, the average standard deviation of relative output gap is over 2% of GDP. National business cycles are imperfectly correlated and when they are, their amplitudes may considerably differ. Cyclical fluctuations in EMU countries therefore reflect about as much a common component and country-specific fluctuations. This is confirmed by a more formal analysis relying on a principal component method, which finds that at most 60% of fluctuations can be ascribed to the common component, and thus, at least 40% is the result of idiosyncratic shocks or of the asymmetric transmission of common shocks (European Commission 2018). In addition, there is no empirical evidence of greater cyclical convergence over time. In other words, it is incorrect to consider that large asymmetric cyclical developments are irrelevant. Source: AMECO database, authors' calculations. Overall, there remain significant asymmetric shocks, or at least asymmetric cyclical developments, across EMU countries, which by definition cannot be addressed by the single monetary policy. In fact, the monetary stance may contribute to cyclical differentials, as it is likely to be too supportive for countries in more favourable cyclical positions than the average and vice versa. The presence of a relatively large common business cycle component also has implications. It justifies attention to the overall euro area fiscal stance, at least in circumstances such as the lower bound where the ECB may benefit from an aligned fiscal policy for counteracting large shocks, as happened during the early 2010s. While this possibility was largely ignored at EMU inception, the experience has dramatically shown it to be relevant in the environment of the 2010s, and it is likely to remain relevant in the future. This means that conceptually, a common stabilisation capacity may not just be focused on asymmetric shocks, but may also usefully cater for large symmetric shocks, thereby also overcoming the limitations of coordinating the aggregate euro area fiscal stance from national fiscal policies. Private risk sharing remains underdeveloped in the EU, as highlighted by comparisons with the situation in the US (Buti et al. 2016). Private risk sharing works by the combined effects of cross-border ownership of assets and labour compensation as well as credit markets (saving and borrowing). 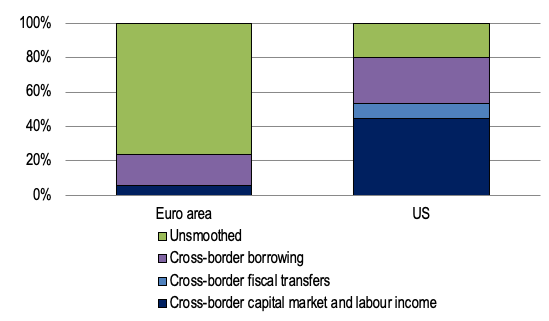 In the euro area the effect of cross border factor incomes (capital and labour) has so far been to smooth a meagre 6% of asymmetric shocks, compared with over 40% in the US (Figure 2). The potential for improvement in this area is therefore large, and a well-functioning CMU would definitely contribute to this. The credit channel, which actually is better understood as consumption smoothing rather than risk sharing stricto sensu (Alcidi and Thirion 2016), is also more developed in the US. Source: Buti et al. (2016). Full financial integration is unlikely to be reached in the short or even medium term, as it requires deep structural changes. For instance, it will take time to diversify cross-border holdings, and a certain degree of home bias may persist even in the long term in the presence of asymmetric information. This alone could be enough to justify a central fiscal capacity at least as long as the degree of financial integration remains limited. But more fundamentally, the question is whether a complete financial union can be seen as a substitute to a targeted fiscal capacity, or whether the two act as complements that strengthen each other, as is the case in the US. The evidence suggests that financial and fiscal unions may substitute as shock absorbers in normal times but need each other in bad times. In other words, in times of acute market stress, the shock absorption function of the financial union will depend on the existence of a credible and effective central fiscal capacity. Specifically, there is evidence that private markets behave pro-cyclically when left entirely on their own. In the case of EMU, cross-border financial flows increased somewhat in the run up to the crisis before collapsing afterwards. In other words, the credit channel for smoothing shocks froze during the euro area crisis and actually worked in reverse (Furceri and Zdzienicka 2015). Private risk sharing is more effective when working in conjunction with public sector risk sharing. Some studies also point out that financial markets are not Pareto-efficient as private agents fail to hold the kinds of portfolios ensuring proper risk sharing in large shocks (Fahri and Werning 2017). The pro-cyclicality may in part be explained by an inadequate structure of financial flows, such as the proportion of debt versus equity. And progress in financial supervision and more effective macroprudential policies should help. At the same time, it would be perilous to assume that financial booms and busts together with flights to safety and sudden stops are behind us in the euro area. Instead, the risk of a re-run of mechanisms similar to the ones experienced in the past crisis seem hardly negligible. The experience in Europe and elsewhere suggests that these risks are attenuated with a public tool that acts as a catalyst for confidence (Kalemli-Ozcan et al. 2014). In this context, the existence of a fiscal risk-sharing tool can actually foster risk reduction by preventing excessive market volatility and full-blown financial crises. Moreover, moving to a genuine financial union will require a more comprehensive approach than implied by some authors, including Heijdra et al. (2018). The recent experience and discussions clearly indicate the difficulties in going ahead to complete the Banking Union as there is no agreement yet on even the technical elements which should allow political negotiations to start on a European Deposit Insurance Scheme. The Banking Union needs to be completed with the backstop for the Single Resolution Fund and the European Deposit Insurance Scheme. The introduction of these forms of public risk sharing is crucial in order to make the system robust by strengthening financial stability, reducing pro-cyclicality, and maximising its capacity to smooth asymmetric shocks via private sector risk sharing. While prudential and bail-in rules will help to contain and reduce risks and prevent them from having a fiscal impact, this does not eliminate the need for a public backstop. In this respect, an excessive focus on risk-reduction measures would, ironically, lead to increasing risks. For instance, there are good reasons to proceed very cautiously to avoid the risk of financial instability when considering any changes to the regulatory treatment of bank sovereign exposures. Should such a proposal be contemplated, one would also need to consider a broader set of measures including a credible backstop to the SRF, the setting up of EDIS and the introduction of a suitable common European safe asset to take a central role in the financial system (Buti et al. 2017). By reducing the risk of flight- to-safety and sudden stops in times of market stress, such a common safe asset would also reinforce the shock-absorbing role of the financial union through private sector channels. Q3: Do national fiscal stabilisers within the SGP suffice to smooth the remaining shocks? Contrary to the US, the EMU does not have a large central budget which provides stabilisation as a 'by product' of its allocative and redistribution functions. At the same time, Member States of the EMU have very large national budgets with significant stabilisation capacities. The rules of the SGP, while primarily focused on ensuring fiscal discipline, have been crafted and evolved in a manner that aims at preserving stabilisation role of national fiscal policy. In principle, adherence to the balanced budget rule in structural terms, the medium-term objective (MTO), provides room for the automatic stabilisers to play out in ordinary cyclical situations without breaching the 3% reference value for excessive deficits. Preserving prudent fiscal positions including by constituting buffers in the good times is essential for this work. Hence there is in general agreement that national automatic stabilisers should constitute the primary fiscal line of defence against demand shocks.1 The disagreement is on the need for a central fiscal tool in addition to that. Here, we believe that the sceptics miss three points that tilt the case. First, the frequency and magnitude of country-specific shocks is relatively large, as noted above. Admittedly, this is especially true for the more volatile economies of the euro area. The Baltic economies offer a good example. Second, the gyrations in the public finances triggered by exogenous shocks are often far stronger than as conventionally measured. The standard measurement of cyclical deficits based on the output gap relies on average values for fiscal elasticities (Mourre et al., 2014). In practice, growth composition effects and residual technical factors imply that the sensitivity of the budget to economic shocks can be considerably greater. 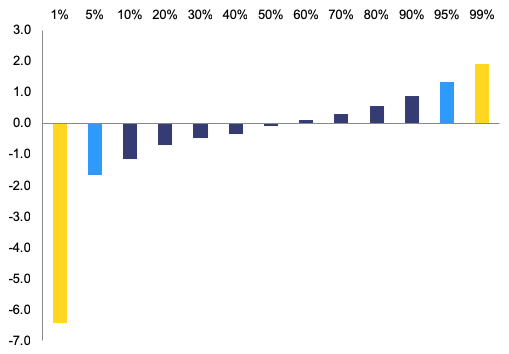 As an illustration, Figure 3 reports the distribution of tax windfalls and shortfalls that come in addition to conventionally measured cyclical deficits. In a downturn changes in headline balances will reflect variations in these windfalls and shortfalls together with the change in conventional cyclical balances. Putting these factors together, the evidence is that cyclical changes in headline fiscal balances typically exceed 3% of GDP every 10 years, and 5% of GDP every 20 years. This goes beyond the protection offered by medium-term objectives, especially when the latter are met in good times by flattering temporary windfalls, as was the case in previous cycles. Third, the legacy of high debts in some countries greatly complicates the use of stabilising national fiscal policies. 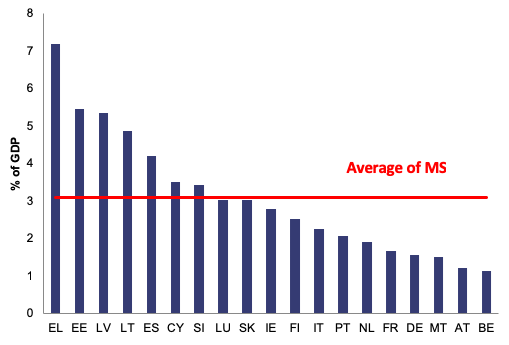 Member States with high levels of debt are in an especially fragile position. When faced with a significant slowdown accompanied by large revenues shortfalls, they may very quickly come under the suspicion of markets, even when actually adhering to the agreed spending policies. These countries may be facing an unpalatable choice between tightening policy at the wrong time to reassure markets and risking a self-fulfilling spiral of higher deficits and interest costs.2 In those circumstances, an element of fiscal risk sharing can tip both policies and expectations towards a better equilibrium and prevent the materialisation of self-destructing austerity or a full-blown meltdown. This is not mutualisation but insurance for the benefit of the whole Union. These considerations make the case for completing the economic architecture of EMU, including in particular a common fiscal capacity to top up the national automatic stabilisers in the event of large shocks. To be sure, the design of such an instrument needs to be well conceived in order to be timely and effective, while preserving against the risk of degenerating into a hidden transfer union. Several worthy proposals have been made in this respect (e.g. Carnot et al. 2017, Arnold et al. 2018, Lenarcic and Korhonen 2018). It is important to also stress that a stabilisation capacity would complement the fiscal rules framework and could actually contribute to strengthen it, by encouraging the build-up of fiscal buffers in good times and making it easier to implement rules of fiscal discipline (European Fiscal Board 2018). In due time, the fiscal rules framework could also be simplified and strengthened, for example by focusing on a debt anchor and a proper operational target. First, the rules for activating support are targeted exclusively on large shocks of a cyclical nature. The triggering criterion relies on a 'double condition' on observed unemployment rates whereby unemployment must at the same time be historically high and strongly increasing (by over 1 percentage point). Moreover, payments are tied to changes in unemployment rates, precluding by construction indefinite support. Second, Member States are eligible to support only if they have delivered effective action on recommendations under the corrective procedures of the SGP and of the Macroeconomic Imbalance Procedure. Third, the support takes the form of the provision of loans, possibly at concessional rates, but does not involve outright transfers. The provision of direct transfers could be more powerful in terms of stabilisation but admittedly would open more risks of permanent transfers. By definition loans would entail permanent transfers only under the extreme assumption of a default by a Member State vis à visthe Union. Simulations using real time data over the past three decades confirm that the proposed mechanism would have been timely and would have potentially benefited all Member States at a certain point. They show that the support would have been concentrated in the most severe downturns and would have extended to a maximum half of the area at peak points, that is, in 2009-10 and 1993-94 (Figure 4). From the inception of the euro it has been asked whether the EMU set-up offered enough space for macroeconomic stabilisation. This question arises naturally as countries in a monetary union lose channels of adjustment to asymmetric shocks by giving up an own monetary policy and the possibility of nominal exchange rate changes. The initial understanding at Maastricht was that this loss might be 'compensated' by a natural convergence of business cycles within the union. In addition, national fiscal policies remained available in order to absorb country-specific shocks. However, the experience suggests that these assumptions were too optimistic. 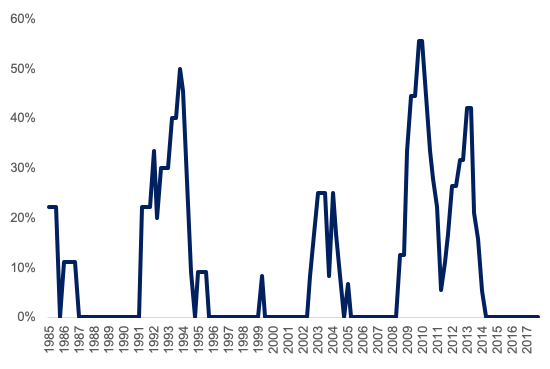 Even if they are partly synchronised, business cycles remain sizeable in EMU. They reflect both a common component and substantial idiosyncratic cyclical developments in Member States. National fiscal stabilisers have functioned at times and in some countries, but have also exhibited serious limitations. Market mechanisms have not been a reliable shock absorber either and the importance of financial markets was underestimated. Indeed, recent evidence shows that markets can have a pro-cyclical effect in times of stress if not complemented by a credible fiscal risk-sharing set up. Looking forward, the two priorities to deepen the EMU are the completion of the financial union as well as the introduction of targeted and effective common budgetary instruments. They complement and reinforce each other. The debate on the nature of further budgetary instruments is gradually gaining traction. Germany and France have recently proposed in the Meseberg declaration the setting up a euro area budget within the EU budget to support convergence, competitiveness, and stabilisation. Other ideas have also been evoked such as unemployment reinsurance funds. The Commission has proposed new tools as part of the next Multiannual Financial Framework for 2021-2027, including a Reform Support Programme to promote reforms for national resilience and a European Investment Stabilisation Function. The latter has been designed to prevent any risk of mutualisation and to complement national fiscal stabilisers only in the event of large cyclical shocks. These various proposals from Member States and the Commission are non-exclusive and might actually be combined. They should go hand in hand with further financial integration and a sound implementation of the fiscal rules. Authors’ note: The views expressed in this column are those of the authors and should not necessarily be seen as reflecting the position of their institution. The authors thank Gabriele Giudice, José Leandro, Gilles Mourre and Lucio Pench for their comments. Alcidi C, D'Imperio P and G Thirion (2017), “Risk-sharing and consumption-smoothing patters in the US and the euro area: A comprehensive comparison”, CEPS Working Document, N°2017/4. Arnold N, Barkbu B, Ture E, Wang H and J Yao (2018), “A central fiscal stabilisation capacity for the euro area”, IMF staff discussion notes, N°18/03. Bénassy-Quéré A, M Brunnermeier, H Enderlein, E Farhi, M Fratzscher, C Fuest, P-O Gourinchas, P Martin, J Pisani-Ferry, H Rey, I Schnabel, N Veron, B Weder di Mauro and J Zettelmeyer (2018), “Reconciling risk sharing with market discipline: A constructive approach to euro area reform”, CEPR Policy Insight No 91. Buti M and V Gaspar (2015), “Designing fiscal policy for steady, enduring growth”, VoxEU.org, 10 December. Buti M, Leandro J and P Nikolov (2016), “Smoothing economic shocks in the Eurozone: the untapped potential of the financial union”, VoxEU.org, 25 August. Buti M, Deroose S., Giudice G and J Leandro (2017), “Completing EMU”, VoxEU.org, EU, 13 July. Carnot N, M Kizior and G Mourre (2017), “Fiscal stabilisation in the euro area: A simulation exercise”, CEB Working Paper, N°17-025, Université Libre de Bruxelles. Draghi M (2018), Hearing of the Committee on Economic and Monetary Affairs of the European Parliament, 26 November. European Fiscal Board (2018), Annual report 2018. European Commission (2018a), “Proposal for a Regulation of the European Parliament and of the Council on the establishment of a European Investment Stabilisation Function”, COM(2018) 387. European Commission (2018b), “Impact assessment accompanying the proposal on the establishment of a European Investment Stabilisation Function”, Staff working document, SWD(2018) 297. Fahri E and I Werning (2017), “Fiscal Unions”, American Economic Review 107(12). Feld L (2018), “Whither a fiscal capacity in EMU”, VoxEU.org, 31 July. Furceri D and A Zdzienicka (2015), “The euro area crisis: Need for a supranational fiscal risk sharing mechanism?”, Open Economies Review 26(4). Heijdra M, T Aarden, Hanson J and T van Dijk (2018), “A more stable EMU does not require a central fiscal capacity”, VoxEU.org, 30 November. Kalemli-Ozcan S, E Luttini and B Sorensen (2014), “Debt crises and risk sharing: The role of markets and sovereigns”, Scandinavian Journal of Economics 116(1). Lagarde C (2018), “A compass to prosperity: The next steps of euro area economic integration”, Speech at the German Institute for Economic Research, Berlin, 26 March. Lenarcic A and K Korhonen (2018), A” case for a European rainy day fund”, European Stability Mechanism Discussion Paper, N°5. Mourre G, C Astarita and S Princen (2014), “Adjusting the budget balance for the business cycle: the EU methodology”, European Economy Economic Papers, N°536. OECD (2018), Economic survey of the euro area, OECD Publishing, June. It may also be useful to enhance national automatic stabilisers (Buti and Gaspar 2015). Note that while the SGP provides for escape clauses in exceptional circumstances, activating those would not fundamentally change the terms of this dilemma.